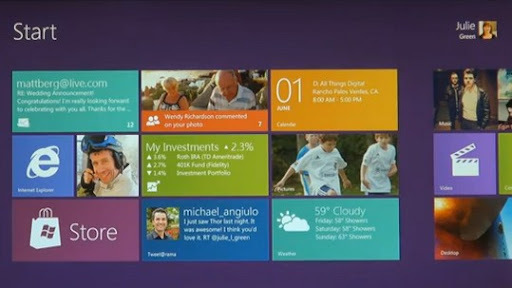 Windows 8 flaunts a re-imagined interface for a new generation of touch-centric devices. Described by Microsoft as 'Fast, fluid and dynamic', the follow-up to the current Windows 7 keeps the power, flexibility and connectivity of Windows intact while providing a transformed user experience. 1. Fast application launching from a tile-based Start screen, replacing the traditional Windows Start menu with scalable, customizable full-screen view of applications. 2. Live application tiles with notifications, showing fresh information and updates. 3. Fluid switching between running applications. 4. Ability to resize and snap an app to the side of the screen, for convenient multitasking. 6. True touch-optimized browsing, with a redesigned virtual keyboard and hardware-accelerated Internet Explorer 10. Truth be told, Windows 7 is starting to feel dated. Consumers' familiarity with touchscreen devices that fully integrate social media and cloud computing really makes the current PC OS experience feel all the more clunky and perhaps inefficient. Just a few years ago, the technorati would say that the future of computing is going to be cloud-based, and touch and social media centric. Well, the future is obviously now. The world has changed so much since the overwhelming success of Windows XP; Facebook is now the most visited website in the world and Twitter has transformed into a real-time search engine, among others. I'm just glad Windows is slowly starting to reawaken from a seeming slumber; Hopefully, this challenges developers of all kind to bring the revamped experience even higher. I hope that one's for touchscreen devices only. All those sliding(switching between applications,horizontal scrolling, etc) will be a burden if you're using a mouse, I guess.